Nearly a year after the launch of Pokémon Sun and Moon, we’re getting two brand new additions to the story. Named Pokémon Ultra Sun and Ultra Moon, these releases are doing something a little different to the traditional third game in the generation - like Pokémon Emerald to Sapphire and Ruby for example, or Platinum to Diamond and Pearl. Pokémon Ultra Sun and Ultra Moon are taking the same area used in Sun and Moon, known as Alola, and telling a totally different story that builds on that of the base games. That means new Pokémon to catch and train, new people to meet and even a few more gameplay features. I got the chance to speak to Shigeru Ohmori, director on the first Sun and Moon and Kazumasa Iwao, who’s making his directorial debut with Ultra Sun and Ultra Moon about all the exciting new additions. Probably the most unique feature coming to Ultra Sun and Ultra Moon is something that will take you away from the tropical climes of Alola entirely. The Ultra Beasts were introduced in Sun and Moon, but until now we’ve had little idea of where they’ve come from, so it’s easy to see the appeal of this new feature. Apparently, travelling through an Ultra Wormhole will also introduce you to another city called Ultra Megalopolis, which is shrouded in darkness after the Ultra Beast Necrozma stole all the light. Of course, this all ties into the biggest theme of Ultra Sun and Ultra Moon’s new story - Necrozma. 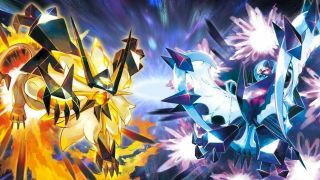 This new Ultra Beast is stealing the show for the new pair of games, and even takes over the Legendaries from Sun and Moon - Lunala and Solgaleo. But don’t worry, there are some familiarities too for those who have already sunk hundreds of hours into Sun and Moon. “You’ll see some returning characters from Sun and Moon, including Hau and Lillie, but you’ll see a whole new side of them as you progress through the story of this game,” says Ohmori. Any Pikachu fans like me might have spotted the strange clubhouse in the first reveal trailer for Pokémon Ultra Sun and Ultra Moon. Well, it turns out it’s not just some kind of Pikachu caravan you’ll see in these new games - there’s a whole valley dedicated to the little yellow mouse. “There are a lot of things you can do in Pikachu Valley and events with Pikachu. You can get some different outfits and other things. It’s just really cool,” says Iwao. And I totally agree. Some speculated that the moment in the original reveal trailer for Pokémon Ultra Sun and Ultra Moon where a Wingull flies above the player is a sign that your Pokémon would follow you around, like Pikachu did way back in Pokémon Yellow. Unfortunately, that’s not actually the case - that’s news straight from Iwao - but it is an indicator that GameFreak is making sure Alola feels more realistic than ever. But it’s not all about new Pokémon and a fresh storyline - Ultra Sun and Ultra Moon are also introducing a couple more new gameplay features, alongside Ultra Warp Ride that is. Firstly, you’ve got the Mantine Surf feature, which takes the traditional surf feature (where you’re riding on the back of a Pokémon with the right HM) and turns it into a sport. You’ll be able to compete for high scores by doing tricks as well as letting Mantine help you get from one island to another. “We’ve also got the Alolan Photo club, which is where you can take photos of Pokémon you’re adventuring with,” adds Ohmori. “You can turn those photos into decorations that you can share with other players in the Festival Plaza.” It definitely sounds a lot more involved than the restricted PokéFinder of Sun and Moon, which is limited to specific areas and doesn’t actually let you do anything with the photos that you do take. There are also new Z-Moves to discover. These special moves first appeared in the original Sun and Moon, but were limited to the Pokémon that you had unique Z-Ring stones for, including Pikachu and the trio of starter Pokémon in the game - Popplio, Rowlet and Litten.